Logan fills his fish wish! ISLAMORADA, Fla. (AP) — A 19-year-old Alabama high school graduate who is confined to a wheelchair and legally blind was still beaming Sunday, the day after he reeled in a 105-pound swordfish off the Florida Keys. In September 2008, Logan Prickett of Montgomery had a near-fatal reaction to intravenous contrast dye used in an MRI to examine his pituitary gland. He was in a coma for 12 days, was left with severe motor-control deficiencies and couldn't speak above a whisper. But Prickett returned to school and in late May graduated among the top 10 students in his high school class. Earlier in the school year his mother, Tammy Prickett, began discussing a post-high school graduation trip with her son and his friend Hunter Mills. 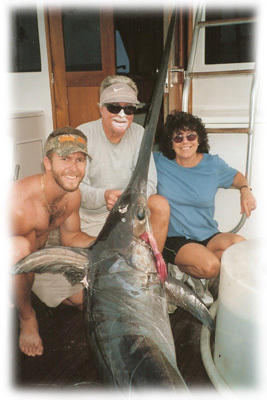 "Together they said 'we want to go to the 'Sportfishing Capital of the World' to catch a swordfish,'" TammyPrickett said. They chartered with 29-year-old Nick Stanczyk, skipper of the Bn'M II, who has led clients to numerous swordfish and other trophy fish. Friday was their first day of fishing and they lost two swordfish. They had better luck on Saturday when Prickett used an electric-assist reel and cranked a 105-pound swordfish to the boat. "Logan had the biggest smile of anyone I've ever seen," said Stanczyk. "I cried. It's the happiest I've ever felt for someone catching a fish." Tammy Prickett said her son will study at Auburn University's Montgomery campus in the fall and hopes one day to manage an aquaculture business. "He wants to overcome as much as he can and prove to himself he can," Prickett said. "It shows others we don't have to let our circumstances limit our lives."